Fort Ancient is a name for a Native American culture that flourished from 1000-1750 CE among a people who predominantly inhabited land along the Ohio River in areas of modern-day southern Ohio, northern Kentucky, southeastern Indiana and western West Virginia. They were a maize-based agricultural society who lived in sedentary villages and built ceremonial platform mounds. 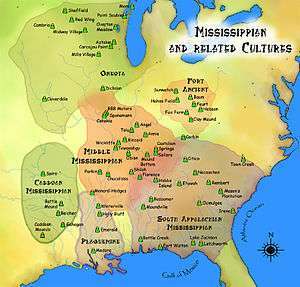 The Fort Ancient culture was once thought to have been an expansion of the Mississippian cultures. It is now accepted as an independently developed culture that descended from the Hopewell culture (100 BCE–500 CE). The Fort Ancient Culture's most famous mound is called the serpent mound. The rise in socio-political complexity evidenced by the building of substructure mounds and new village layouts may indicate influences from Middle Mississippian cultures down the Ohio River (the northeastern most extent of Middle Mississippian was the Prather Complex in the Falls of the Ohio region 95 miles (153 km) away). The differences in ceramics show they were a culture distinct from that of the Middle Mississippian peoples. Fort Ancient settlements lacked Mississippian traits such as political centralization and elite social structures. Buckner Site A Middle Fort Ancient site located in Bourbon County, Kentucky on Strodes Creek. It has two large circular village areas, each surrounding its own central plaza and several smaller special use areas to the north and northeast of the site. Fort Ancient Site The site is the largest prehistoric hilltop enclosure in the United States with three and one-half miles (18,000 ft) of walls in a 100-acre (0.40 km2) complex, built by the Hopewell peoples, who lived in the area from the 1st century BCE to the 6th century CE. Centuries later during the Fort Ancient period a village and cemetery were constructed within the embankments. When archaeologists excavated the site in the nineteenth century they mistakenly believed the "fort" and the village were built by the same people. It is located in Washington Township, Warren County, Ohio, along the eastern shore of the Little Miami River about seven miles (11 km) southeast of Lebanon on State Route 350. Located 95 kilometres (59 mi) down the Ohio River to the southwest of the western most Fort Ancient settlements were the Middle Mississippian culture peoples of the Prather Complex. This stretch of river was an empty buffer zone, possibly for social or political reasons, although it may also been because the narrowing of the alluvial valley between the Falls of the Ohio region near Louisville, Kentucky and the mouth of the Miami River at Cincinnati, Ohio made it less suitable for the intensive maize agriculture practiced by both societies. ↑ "The Builders of the Mounds". Spanish Hill. Retrieved 2008-09-12. ↑ "Ohio Archaeoloy Blog". Retrieved 2008-09-11. 1 2 "Middle to Late Fort Ancient Society". Retrieved 2011-02-23. 1 2 3 4 5 6 Sharp, William E. (1996). "Chapter 6:Fort Ancient Farmers". In Lewis, R. Barry. Kentucky Archaeology. University Press of Kentucky. pp. 162–176. ISBN 0-8131-1907-3. 1 2 Clark, Jerry E. "Shawnees". The Tennessee Encyclopedia of History and Culture. Retrieved 2011-02-23. ↑ Peregrine, Peter N.; Ember, Melvin, eds. (2001). "Volume 6 : North America". Encyclopedia of Prehistory. Springer. p. 175. ASIN B000QW8Z54. ISBN 0-306-46260-5. ↑ Snow, Dean R. (2010). Archaeology of Native North America. Pennsylvania State University, Prentice Hall. ↑ "Mississippian and Late Prehistoric Period". Retrieved 2008-09-12. ↑ Griffin, James B. (1967-04-14). "Eastern North American Archaeology: A Summary". Science. AAAS. 156: 175–191. doi:10.1126/science.156.3772.175. 1 2 "Fort Ancient Web:Pottery". Retrieved 2011-02-23. 1 2 3 Lepper, Bradley T. (February 2005). Ohio Archaeology:An Illustrated Chronicle of Ohio's Ancient American Indian Cultures. Orange Frazer Press. pp. 198–203. ISBN 978-1-882203-39-0. ↑ Cook, Robert Allen (2007). Sunwatch: Fort Ancient Development in the Mississippian World. Tuscaloosa: U of Alabama P. pp. 44–49. ↑ Hoffman, Darla S. (2010). "Buffalo Archeologincal Site". West Virginia Encyclopedia. Retrieved 2011-02-24. ↑ "Fort Ancient Earthworks". Ohio History Central:An Online Encyclopedia of Ohio History. Retrieved 2011-02-24. ↑ Murphy, James L. (1968-09-27). "The Hobson Site: A Fort Ancient Component Near Middleport, Meigs County, Ohio" (PDF). Kirtlandia. Cleveland, Ohio: Cleveland Museum of Natural History (4): 1–14. ISSN 0075-6245. ↑ "Leo Petroglyph". Ohio Historical Society. Retrieved 2011-02-24. ↑ Brady-Rawlins, Kathleen. The O.C. Voss Site: Reassessing What We Know about the Fort Ancient Occupation of the Central Scioto Drainage and Its Tributaries. Diss. Ohio State University, 2007. Accessed 2010-06-17. ↑ "Redating Serpent Mound". Archaeology. 49 (6). Retrieved 2008-09-12. ↑ "Serpent Mound". Retrieved 2008-09-12. 1 2 Gosman, James Howard (2007). "Patterns in Ontogeny of Human Trabecular Bone from Sunwatch Village in the Prehistoric Ohio Valley" (PDF). Ohio State University. Retrieved 2010-04-14. ↑ Cook, Robert Allen (2007). Sunwatch: Fort Ancient Development in the Mississippian World. Tuscaloosa: U of Alabama P. p. 139. ↑ Brady-Rawlins, Kathleen (2007). "The O.C. Voss Site: Reassessing What We Know about the Fort Ancient Occupation of the Central Scioto Drainage and Its Tributaries" (PDF). Ohio State University. p. 26. Retrieved 2010-04-12. ↑ "Monongahela culture-AD 1050-1635". Retrieved 2010-01-14. 1 2 "Geophysical Methods and the Archaeology of Late Prehistoric Central Indiana". Retrieved 2010-02-25. ↑ Redmond, Brian G. "An Archaeological History of Northeast Ohio Before the Western Reserve: An Archaeological History of Northeast Ohio". Retrieved 2011-02-24. ↑ Muller, Jon (2009-05-31). Archaeology of the Lower Ohio River Valley. Left Coast Press, Inc. p. 259. ISBN 978-1-59874-451-4. ↑ Munson, Cheryl Ann; McCullough, Robert G. (2004-10-21). Prather Site (12-CL-4), Clark County, Indiana : The 2003 Baseline Archaeological Survey (PDF). Southeast Archaeological Conference / Midwest Archaeological Conference. St. Louis, Missouri. ↑ Munson, Cheryl Ann; McCullough, Robert G. (August 2004). Archaeological Investigations at the Prather Site (12-CL-4), Clark County, Indiana : The 2003 Baseline Archaeological Survey (PDF). Wikimedia Commons has media related to Fort Ancient culture. Griffin, James B. (April 1937). "The Chronological Position and Ethnological Relationships of the Fort Ancient Aspect". American Antiquity. Society for American Archaeology. 2 (4): 273–276. doi:10.2307/275464. JSTOR 275464. Phillips, Philip (1939). "Chapter 2 : The Upper Mississippi "Phase"". Introduction to the Archaeology of the Mississippi Valley (PDF) (Doctor of Philosophy thesis).